The killing of Professor Maleeshappa Madhivallapa Kalburgi on 30th August 2015 came as a severe jolt to all those who are for an open, liberal society, who uphold the values of reason and are against blind faith. Prof. Kalburgi was a renowned scholar with over 100 books to his credit. He had brought to fore the ideology of Basavanna; the 12th Century poet saint of Kannada; and had supported the idea that Lingyats, the followers of Basavanna be given the status of religious minorities as they do not belong to the Vedic tradition. His study of Vachanas, the teachings contained in the verses of Basavanna, was a profound contribution to the rational thought. It was his forthright reminder of Basavanna’s teachings, criticism of idol worship and Brahmanical rituals, which earned him the wrath of Hindutva groups like Bajrang Dal. As there are many traditions within the broad pantheon of Hinduism, the atheist tradition has its own existence from centuries, Charvak being the one from ancient times. Even opposition of idol worship is not new to Hindu traditions as Swami Dayanand Sarswati, founder of Arya Samaj, had given the call to stop the idol worship. Incidentally as we are receiving the news of this killing, the neighboring Bangla Desh has witnessed the murder of three young secular bloggers in recent times (2015). In Syria a Scholar Khaled al-Assad has been put to death by ISIS fanatics. Maharashtra was shaken by the murder of a rationalist of repute Dr. Narendra Dabholkar nearly two years ago. He was instrumental in getting the law against black magic and practices related to blind faith passed in Maharashtra. Another well respected activist, Comrade Govind Pansare was killed just a year ago. Pansare was working on many issues; anti-blind faith campaign being one of them. He is also the author of well known tract on Maharashtra’s revered king Shivaji. Contrary to the communal presentation of Shivaji as anti Muslim king, Pansare shows that Shivaji was the king who was very sympathetic to the farmers (rayyat) and that he was respecting all religions. This interpretation of Shivaji is a great eyesore to the Hindutva politics. On the back of the murders of these two rationalists, comes the murder of Dr. M.M. Kalburgi on 30th August 2015 in his home in Dharwad. Prof Kalburgi was a very well accomplished man, ex Vice Chancellor of Kannada University in Hapmi, and recipient of National and Karnataka Sahitya Academy Awards for his writings. The learned professor had deep study of Virshaiva, Basavanna tradition amongst others. The opposition to him was due to his criticism of idol worship, Brahmanical rituals and ritualization of Basavanna tradition by Lingyats. Controversies followed him and so did the threats from conservative forces. The first one of which, was the publication of Marga treatise on Kannada folklore including articles on Virshaiva, Basavanna. Due to the death threats to him time and over again police protection was given. This police protection was withdrawn on his request recently. He supported U.R. Anathmurthy on the issue of stopping idol worship. When he invited VHP leaders and the pontiff of Vishveshra Tirtha Swami for a public debate; another controversy followed. His support to Karnataka bill against practices of superstition invited anger of Bajarang Dal and associate organizations and he had to face protest; where his effigy was burnt. There is a pattern in the murders of Dabholkar, Pansare and Kalburgi. Though there are some differences in the broad range of field of their social engagement, the similarity is very striking. They were rational, they made their voice abundantly clear and many threats were received by them. Another stark similarity is that all these three murders took place in early mornings by those who came on motor cycles, one person driving the bike and the second one pumping bullets. Strangely despite a long lapse of time the killers of Dabholkar and Pansare have not been nabbed so far. After the murder of Kalburgi one Bajrang Dal activist Bhuvith Shetty tweeted, ***"Then it was UR Ananthamurthy and now MM Kalburgi. Mock Hinduism and die dogs (sic.) death. And dear KS Bhagwan you are next" . *** This tweet was later withdrawn. 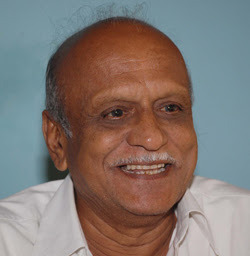 Also many a person’s related to Hindu right wing organizations started saying that Kalburgi had insulted Hindu gods, so anger among Hindus and so such murders. This is a subtle justification of the intolerance which our society is being gripped with. As such the attitude of communal elements in different religions is very similar. One recalls the threat to Salman Rushdie, the type of intolerance shown to Taslima Nasreen and the murder of bloggers in Bangla Desh and also murder of Salman Taseer in Pakistan. Taseer had stood in defense of a Christian woman who was accused of blasphemy. The opposition to the voices of reason has been going on in History all through. One can as well begin with Charvak, who opposed the Brahmanical understanding about the world, divine nature of Vedas in particular. Charvak said Vedas are manmade, social in nature, and was persecuted. Gradually with the power of clergy the imposition of faith on society became more institutionalized. Even teachings of Gautam Buddha, who was agnostic, and talked about the social nature of human problems, were attacked. This had led to the wiping out of Buddhism from India. The medieval Bhakti saints were also more for rational thinking, critical of the imposition of various social practices-rituals in the name of faith. Many saints like Tukaram in Maharashtra had to face persecution at the hands of those who were close to social power, the clergy. Globally one can see the same pattern in Europe. In Europe the scientists, rational thinking had to face the opposition from organized Church, which condemned Galileo to hell for stating that the Earth is round etc. Similar was the fate of many scientists who had to face inquisitions and punishments of various types. Clergy hid behind the façade of ‘divine authority’: faith, and tried to stall the process of social change and halt the scientific thinking. The society over a period of time overcame the opposition to the rational thinking and so we saw the rooting of science and scientific inquiry. Clergy had maintained that they are the repository of whole knowledge; as knowledge is already there in our ‘Holy books’. This is a part generalization and it manifested in different cultures and religions in diverse ways. In Pakistan, some Maulanas asserted that the problems related to power can be solved by doing research on djinns, who are power houses of infinite energy; this was presented as part of the religious knowledge. In India with freedom movement, those standing for social change and transformation did stand for rational thinking and critiqued the scriptures from that angle. The traditionalists, who wanted to retain the old social equations; resorted to ‘our glorious heritage of knowledge’. Faith based understanding was counterpoised against the spirit of scientific inquiry. With independence, with Nehru being at the helm of affairs, the notion of ‘scientific temper’ came up in a big way paving the way for establishment of institution of higher learning and research; leading to the national growth and transformation towards democratic structures. This was the time when the nation was looking forward to all round progress and rational thinking was duly promoted. The national science resolution; based on reason and logic was passed unanimously in 1958. Things start changing in the decades of 1980s. The politics in the name of religion came up in a very assertive manner and faith not only continued to be the emotional support system in the times of social anxiety but some political forces started asserting identity politics, faith based politics. Identity issues and faith based politics started getting more legitimacy. The social conservatism and undermining of rational thought went hand in hand. Incidentally it is around this time also when the groups promoting rational thought, scientific temper, groups to oppose blind faith, came up. The most prominent of these groups was Kerala Sastra Sahitya Parishad. Later in Maharashtra Narendra Dabholkar took the lead to establish Andhshraddha Nirmulan Samiti (Committee to oppose Blind faith). This took the Maharashtra conservative elements by storm as the volunteers of this organization started going from village to village and started demonstrating the science behind the magic tricks which were being practiced by hoards of God men and other of their tribe, who were taking full advantage of the social insecurity of poor villagers and exploiting them. Pansare, in addition to opposing blind faith was also disseminating the values of Shivaji, presenting him as a person respecting all religions, which Shivaji was. The right wingers could not stomach it; neither could they oppose the logical formulations presented by him. In Karnataka individual like U.R. Ananthmurthy articulated against idol worship and blind faith. Kalburgi not only supported U R Anathmurthy; he also went on the support the bill against the practices promoting blind faith. He did author papers/books to disseminate his ideas. Slightly back in time when the first NDA Government came to power with Dr. Murli Manohar Joshi as the MHRD minister, he introduced the courses like ritualism (paurohitya) and astrology (jyotish shastra) in the universities. This gave a big boost to the ‘faith’ based groups who were politically close to the politics in the name of Hindu religion. With the new Government coming to power (2014) again now the mythology is being promoted as history, the Pushpak viman, ‘plastic surgery in ancient India’ etc. is being promoted; at the same time so called fringe elements, which as such are part of the Hindutva politics, are becoming more assertive. The liberal open space is shrinking and the place of debate is being taken by physical violence. The liberal values which accept the validity of differences is being eliminated by force, intimidation and even partly by state support. The murder of these ‘saintly’ figures , Dabholkar, Pansare and Klaburgi, just goes to show that we are landing in a situation where those entrenched in the conservative values are becoming dominant and do not want the rational thinking to exist in our society. The aggressive stance by the Hindutva right wing on those who are putting forward the rational thought, criticizing the ills of caste system, idol worship etc. is ideological supplement to the politics of Hindu right wing. The march of this politics in recent years has been built around identity issues like Ram temple or cow slaughter. Their whole assertion is built around the Brahmanical Hinduism, which upholds the caste hierarchy. The ideology being propounded by the likes of Dabholkar, Pansare and Kalburgi stands closer to the ideology for liberation from the caste hierarchy, which is the root of HIndutva politics. This politics does target the religious minorities, while ironically Hinduism is so diverse with contradictory tendencies within same religious umbrella. Kalburgi’s murder is part of the larger scheme of things where the ideologies opposed to the present status quo are being hounded along with persecution of those who are struggling to uphold these values. Chatrapati Shivaji Maharaj: To Each Ones’ Own! What did Colonialism do to India?